When you get in the car in the morning to head to school, work, to drop the kids off, or to head to an appointment, what’s on your mind? If you are like most busy Americans, you have about 300 things on your mind…except driving. Our lives and schedules are so busy that they often take our focus off things that need our focus—like driving—because you never know when something or someone can cause an a distraction and an accident. Early this morning, a small plane made an emergency landing on I-595 in Davie, Florida during morning rush hour. 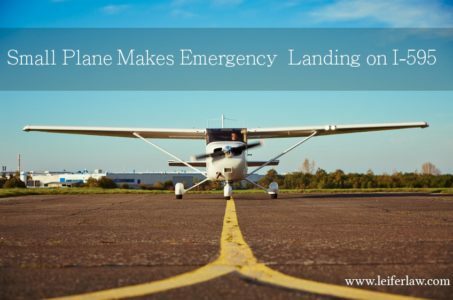 The pilot claims he ran out of gas, which forced him to land the plane. The westbound lanes of I-595 were shut down and traffic was redirected to other routes. The plane’s landing certainly came as a surprise to traveling commuters. It is a surprise that the plane didn’t cause any accidents or injuries, but it is likely that drivers were able to see and hear the plane approaching the highway, giving them ample time to react and slow down. However, while no accidents resulted from this incident, this does go to show that accidents can happen in a moment’s notice. Most of us would admit that this isn’t something we often think about when we get in the car first thing in the morning, but yet reminds us of the importance of driving and remaining alert at all times. If you or someone you love has been involved in a car accident, then you need experienced and professional legal representation. For more information on how a personal injury attorney can help you with your car accident, call the legal team at Leifer Law Firm today. Contact us for your free, initial consultation at 561-395-8055.